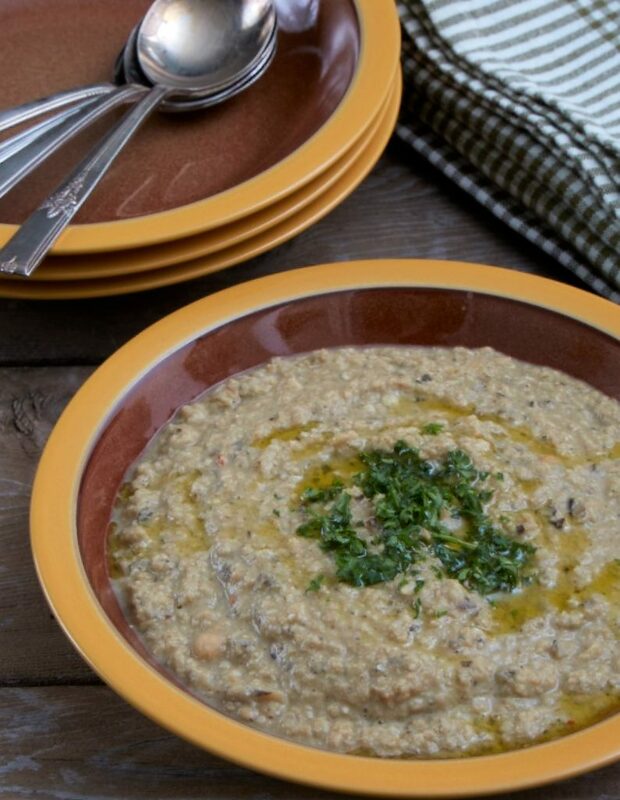 Baba Ganoush gets some of its amazing flavours from oven roasting the eggplants. I have sped up the process by toasting the eggplant in a large saucepan. It was one of those strokes of genius. Toasted became the replacement for roasted, and a little of this and that became this fabulous soup. Rinse the eggplants well, pat dry, trim off the top cap. Cut the eggplants in half horizontally, then each half in half again. Chop into ½ -inch chunks. You should get about 6 cups. Heat a 3 ½ qt. saucepan over medium-high heat. Add eggplant, yes not the oil, just the eggplant. You want to toast the eggplant, not fry it. Keep an eye on the eggplant chunks, flipping as they get brown. This takes about 5-7 minutes, don’t allow them to burn, but you do want a dark brown colour for added flavour. When the eggplant is toasted, add oil and garlic and sauté until garlic is soft, about 3 minutes. Add cumin, coriander, pepper, salt and red pepper flakes. Make sure they are well incorporated. Add broth and stir in, making sure to scrape up any of the browned bits on the bottom of the saucepan. Add chickpeas and tahini and stir to mix in. Bring to the boil, reduce heat to simmer, cover and cook for 15 minutes or until the chickpeas are heated through and all the eggplant is soft. Remove from heat, add lemon juice and either using a hand-held immersion blender or an upright blender, puree the soup until it is almost smooth. I like mine slightly chunky, your call. One serving is equal to 1 cup with 1/5 of the parsley and oil on top. That first time I made this, I ate it out of one of my best soup bowls, just because I felt like it and we need to use our good stuff more often. I mostly buy hot house grown Italian eggplant. They aren’t bitter, so they require no salting, and bonus there are hardly any seeds. It’s Italian hot house eggplant for the win. Look for firm eggplant with very tight skin, think young super model skin, its taunt, not wrinkled.